It happened that two disciples of Jesus were on their way to Emmaus. On the way, they discussed about all the things that had happened to Jesus and asked questions among themselves. While they were still talking, Jesus appeared and walked along with them. The disciples couldn’t recognize Jesus and so they didn’t notice him. Jesus pointed out the scriptures and explained to them. Then He left them. At evening on the same day, when all the doors were shut, Jesus suddenly appeared among the ten disciples. He said to the disciples, “Peace be with you”. The disciples immediately recognize he is Jesus. At first, they have doubt. The disciples touched Jesus hands and side. However, some of them still does not believe, so Jesus took a broiled fish and ate it before them. At that time, Thomas was not among the disciples. 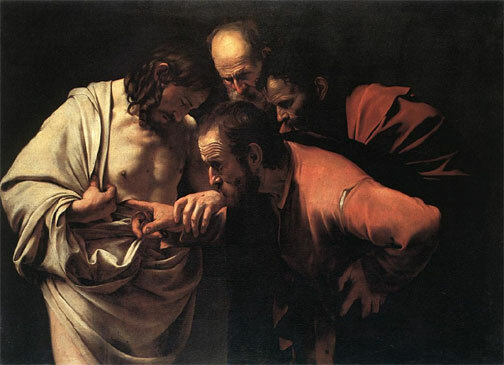 The other disciples said to Thomas, “We have seen the Lord Jesus Christ.” Thomas did not believe them. After eight days, the disciples were assembled inside the house again. All the doors were shut. All of a sudden, Jesus appeared among the eleven disciples. This time Thomas was there too.